Consumer proposal vs bankruptcy - which one is better? Consumer Proposal vs Bankruptcy – Which One is Right for You? 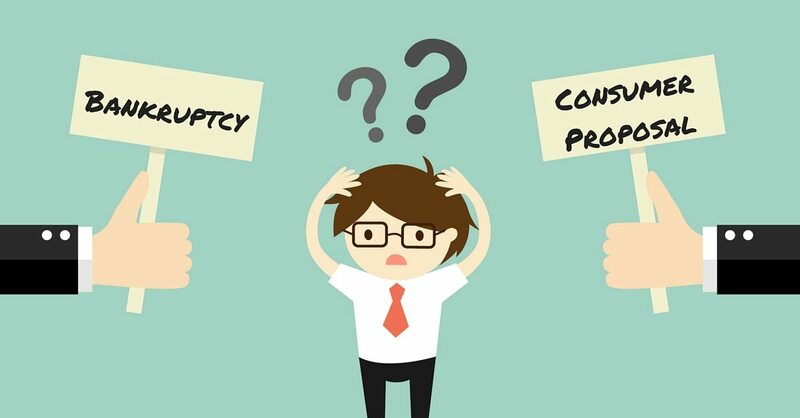 Home » Blog » Consumer Proposal vs Bankruptcy – Which One is Right for You? If you struggling with debt, how do you know which debt relief option is right for you? Both consumer proposals and bankruptcies have similar benefits, but the length and cost are different. Listen to this week’s podcast as Ted Michalos, my partner and co-founder, compares various aspects of filing a consumer proposal vs bankruptcy. Both consumer proposals and bankruptcies provide a stay of proceedings, meaning that all actions against you must stop. Consumer proposals and bankruptcies eliminate the same unsecured debts like credit card debt, tax debts, payday loans and more. What about student loan debt? Both options provide for an automatic discharge of student debt if you have been out of school for 7 years. A consumer proposal requires less ongoing reporting to the trustee than a bankruptcy. In a bankruptcy, an insolvent person has to provide proof of their income and expenses to the trustee for the first seven months of the bankruptcy. The requirement to report income is used to determine if you will have to pay surplus income and how long your bankruptcy will last. The need to report income and expenses to your trustee doesn’t exist in a proposal because you have already provided income information when determining how much to offer your creditors. Once this payment is determined it is fixed so there is no need to further report your income. A consumer proposal usually carries a lower monthly payment. Most people file a consumer proposal because their income is high enough that it would trigger additional surplus income payments in a bankruptcy. Bankruptcies with surplus income will last 21 months. A proposal can run up to 60 months so while you must offer to repay at least the same amount of money as your creditors would expect to receive in a bankruptcy [in total], you can spread out your proposal payments over 5 years. This makes the monthly payment significantly lower. For example, if a bankruptcy is going to produce $10,000 worth of payments to your creditors, you could offer a proposal for $200 a month for 60 months. You can also pay off your proposal faster than five years if your circumstances improve. Once you’ve made your proposal, the monthly payment doesn’t change – even if you earn more income later. This is in contrast to a bankruptcy, where you send in the proof of your income to the trustee, and an increase in earnings could trigger suddenly higher surplus payments. A proposal allows you to keep assets that may be forfeit in a bankruptcy. Your licensed insolvency trustee will ask about what you own. Do you own RESPs, a house, and an expensive car? Do you have any home equity? If you have assets you wish to keep, a consumer proposal is a good option. To determine which debt solution is right for you, meet with a licensed insolvency trustee. They will be able to crunch the numbers and see what each option will cost you based on your financial situation. The trustee will also see what you can reasonably afford and walk you through your options, allowing you to make an informed decision. What Happens If You Stop Paying Your Debts? It’s the last show of the month and as we do at the end of most months it’s time for our Frequently Asked Questions show here on Debt Free in 30, last month on our Frequently Asked Questions show we only got to two questions, this week we’ll try to get through a few more. Last month one of the questions we answered was what are the chances that my consumer proposal will be accepted? Ted Michalos went into a lot of detail on that question so you can go to the show notes over at hoyes.com and listen to the full answer or read the transcript, it was show number 87. One of the factors Ted mentioned was the comparison to bankruptcy, your creditors will only accept a proposal if it’s at least slightly better for them than a bankruptcy. If they expect to get 10 cents on the dollar in a bankruptcy but you only offer them five cents on the dollar in a consumer proposal, there’s not much chance that they’d go for that deal. Which leads us to today’s first question, what are the differences between a consumer proposal and a bankruptcy? To discuss it as always I’m joined by Ted Michalos, my Hoyes, Michalos co-founder. So, Ted let’s break it down piece by piece, consumer proposals, bankruptcy let’s kind of go through it piece by piece here. First question will both of them stop a garnishment. Ted Michalos: They definitely will. The protection provided by both are the same under the law. In fact both proposals and bankruptcies are contained in the bankruptcy and insolvency act of Canada. I don’t want anybody to go out and read it, although they’re welcome to, but it’s all part and parcel. So, any protection that you have in a bankruptcy, you have the exact same protection in a proposal, which is a great feature because most people don’t think the proposals protecting them the same way and that’s just not true. Doug Hoyes: It’s exactly the same. So, does it matter if the garnishment has already started? Ted Michalos: Oh it certainly does not. So, let me explain how a stay of proceedings works, it’s just a legal term that means activity against you has stopped. So, if someone is threatening a lawsuit, the stay of proceedings means that they won’t be able to commence it. If they started a lawsuit, the stay of proceedings means the process has to stop unless they get permission from the court to continue. If they’ve already got an order to garnishee your wages, well the stay of proceedings means that has to stop too because it’s not fair for one creditor to be able to take money off your paycheque when you’re trying to deal with all of your creditors. Doug Hoyes: So if I’m trying to decide do I need to do a proposal, do I need to do a bankruptcy or can I just deal with it on my own, this stay of proceedings thing you’re talking about is kind of a decision maker really. Ted Michalos: It’s probably the most powerful tool in the toolbox for dealing with people who have got debt problems. If you’re afraid that somebody’s taking collection action against you, they’re suing you, they’re going to take money off your paycheque, well a bankruptcy or proposal will put a stop to that. There isn’t any other procedure that will do that except for paying off the loan full. And if you could do that they probably wouldn’t be collecting from you. Doug Hoyes: So if I have a garnishment against me, why can’t I just call up the guy who’s got it, the credit card company, the bank loan and say hey I want to make a deal, can you stop it? Won’t that work? Ted Michalos: Well, you have the right to do that. And depending on the deal you’re offering they might accept it, but frankly you didn’t pay them in the first place, they had to go to the trouble of a collection agency, they had to go to the trouble of a lawsuit to get the money from you. They’re not generally receptive to believing that you’re just going to come through and pay them, particularly on some kind of payment plan. If you owned Visa $10,000 and you said I know you guys are suing me, you’re garnisheeing my wages, I’ll write you a cheque for $7,000 tomorrow, I bet they’d take it. Now if you said to them stop garnishing my wages I’ll pay you $200 a month for the next five years, I bet they won’t. Doug Hoyes: ‘Cause they’ve already got the money coming off your paycheque, they’ve got no incentive to make any deal at that point. Ted Michalos: That’s right. And they’ve already gone to all this trouble. Doug Hoyes: So, when you think it through sequentially then, I get behind on my credit card bill let’s say, what’s the first step then that the credit card is going to do? I get one month behind let’s say. Ted Michalos: Most credit card companies if you’re one month behind, they’ll put a polite reminder on your next bill, we notice you didn’t pay next month, this month you got to pay double, call our offices if there’s anything we can do to help you. The second month you don’t pay, there’s often a phone call or a specific collection letter saying you’re past due, we’d like you to contact us so we can deal with this. The third month is when they generally decide to send it to a third party, so it’s not their in house people trying to collect from you anymore, they’re going to pay somebody to basically hassle you until you pay, a collection agency. Doug Hoyes: And why is that? Ted Michalos: Well, it’s bad for business for a bank to be hassling customers. So, let’s say you owe a large bank $5,000 and you’re not paying them. They will push you to a certain point because a lot of people just need to be reminded and they will come across and pay. But if you’re one of those people that can’t afford to pay, the bank doesn’t want a reputation as being the person that takes you to court or sues you. They don’t want to have the reputation for hassling you, calling you on one of those electronic dialers 10 times a day ’cause you don’t answer the phone. It’s not good for the bank’s business, it’s better for them to let somebody else deal with the problem. Doug Hoyes: So if you’ve been sent to a collection agency then obviously the bank is kind of washing their hands of you. 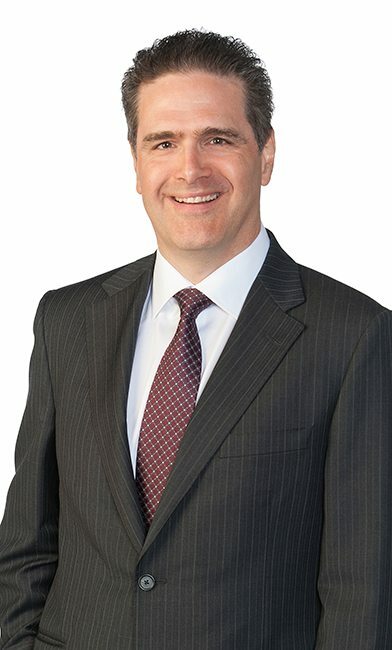 Doug Hoyes: Now we’re talking about consumer proposals, bankruptcies, you said that they work fine for garnishments if the court action has already started or your wages are already being garnisheed, what about collection agencies? Ted Michalos: Well, the same thing. So, a collection agency doesn’t have any more right to hassle you than the original person that loaned you the money, so, the bank or the credit card company. So, you file a proposal or a bankruptcy, they don’t need the legal stay ’cause that’s a technical term, but they are automatically stopped from continuing to bother you. Now you’re in a little bit of a grey area here. The collection agency doesn’t know you filed the proposal right away, so they might call you day you filed or the day after. It usually takes a week, maybe 10 days to actually get them to leave you alone. The fastest way to do that is to actually answer the phone after you’ve filed a proposal or bankruptcy and say look, call my trustee, you’re not allowed to do this anymore. They get the law, they’ll do it. Doug Hoyes: Yeah. When someone files a bankruptcy or consumer proposal with us, we actually electronically file it with the government, the office of the superintendent of bankruptcy immediately, while the person is sitting in front of us. And we can print out what’s called The Certificate of Appointment that has an actual file number assigned by the government, that’s often what the collection agency’s asking for. Ted Michalos: Well and in addition to that we make sure that we list both the company that you owe the money to and any collection agencies or lawyers that are working for them. So, that anybody that’s been bothering you or trying to collect on this debt is notified. And as you say it’s what they’re looking for is proof that you’ve actually filed because they understand the law, once you’ve filed a proposal or a bankruptcy, they no longer have the right to pursue you. You’re not allowed to pay them even if you want to. Doug Hoyes: So, they’re not getting any money, there’s no point in calling. Ted Michalos: It’s a waste of time, yeah, it’s just an expense. Doug Hoyes: Yeah. They get paid for collecting. If they know they’re not going to collect, they’re going to stop pretty quickly. Doug Hoyes: So, when we compare a bankruptcy and a proposal together, they both stop wage garnishments, they’re both going to stop collection calls. What about the debts that are included, do they both include the same kinds of debts? Ted Michalos: They do. Again, it’s all the same law. Think of it as degrees of separation. So, a proposal’s designed for people that can afford to repay part of their debt. A bankruptcy is designed for people who cannot afford to repay any part of their debt. But the protections and the debts that they deal with are the same regardless. And they have to be otherwise you’re not comparing apples to apples. Doug Hoyes: Okay so what debts are included, what debts are not included? Ted Michalos: So, it’s easier to tell you what’s not included than what is included. So, if I don’t list something as being not included, then it is. So, first and foremost you can’t get out of any kind of support order. So, if you owe child support, spousal support, support arrears, a bankruptcy or proposal is not going to stop those debts. Doug Hoyes: And so when you say support order you’re talking about something from the court. Ted Michalos: That’s right, something from family court. You’ve got an obligation to pay somebody because of a past relationship with you. You can’t get out of any debt that was a result of any fraud, malfeasance, misrepresentation. So, this is kind of a funny one. Somebody actually has to prove that your debt was a result of fraud, malfeasance or misrepresentation for it to survive a bankruptcy or proposal. So, usually what happens when somebody sues you, they simply get a judgement against you and the bankruptcy or proposal will stop that. Unless the order say that it’s a restitution order or you were charged with fraud as a result of this, then the debt will still be extinguished. There are also some funny rules regarding student loans. I mean I call them funny because I honestly believe, I don’t think the way we treat student loans is fair under the law. And you and I, we gave evidence before the senate years ago, I still think what they’re doing is wrong. Doug Hoyes: Yeah, you can go to YouTube and type in Hoyes Michalos Senate. It was from 2008; we traveled up to Ottawa and actually said to the senators who were reviewing the legislation that we through the student loan rules were too onerous. What are the rules? Why do student loans not go away in all cases in a bankruptcy or proposal? Ted Michalos: So the way the law sits right now you have to have been out of school for a minimum of seven years for your student loan debt to automatically be discharged, which means eliminated, by a bankruptcy or proposal. They’re provisions in the law that you can apply for a hardship allowance after five years. It’s rarely used because the law never can define what hardship means. So, effectively you go to school, whether or not you graduate or not makes no difference. It’s when were you last registered as a student, that’s when the clock starts, it’s called your end of study date. Seven years from that date you can include a student loan in a bankruptcy or a proposal. Doug Hoyes: So, the rules are the same. So, debts that don’t go away in a bankruptcy or proposal, child support, spousal support as assigned by the court, any debt that resulted from as you called it fraud or malfeasance so if I rob a bank sorry, I’m still going to have to pay that back. Ted Michalos: Or you embezzle a bunch of money from your employer, let’s not go there. Doug Hoyes: Something like that. And then student loans, if I have not been out of school for seven years, they will not automatically go away in a bankruptcy or a proposal. Ted Michalos: The other big one is fines and penalties. So, if you’ve got a speeding ticket or a jaywalking ticket or something like that, the bankruptcy court will not remove you obligation to pay another court’s fine. Doug Hoyes: So, that won’t go away. What about my car loan, my mortgage what we call secured creditors. So, first of all what’s a secured creditor? Everything you mentioned was an unsecured creditor. So, explain the difference between secured and unsecured. Ted Michalos: So, secured creditor is someone who’s loaned you money usually to purchase something or at the very least when they loaned you the money you said if I don’t pay you, you can come and take my house, or my car, or my trailer or my boat. So, secured debts are not dealt with under bankruptcy or proposals unless you surrender the thing you said they could have. So, for example if you’ve got a car lease from a big auto manufacturer and that $700 a month payment is one of the things that’s really screwing up your finances, you have the right in a proposal or a bankruptcy to surrender the vehicle back and then the debt will be eliminated. Similarly you have the right to keep the vehicle as long as you continue to make the payments. And the law actually says if you continue to make the payments, they don’t have the right to come and take the car. So, they can’t say oh, you file a proposal I’m coming to take your car, no. If you say you’re going to keep paying and you do keep paying, they have to let you keep it. And that’s important. Doug Hoyes: Obviously assuming you’re up to date on the payments. I mean if you’re six months behind on the payments, well they take your car whether you’re in a proposal or not. So, okay so most debts are included. There are a few specific exceptions that aren’t and you’ve just gone through all those. Ted Michalos: So, we should actually say very clearly that so we haven’t said anything about government debt so far. Income tax, that sort of thing, they are included in proposals and bankruptcies. There’s a lot of misinformation out there that people seem to think that if you file bankruptcy you still have to pay your old income taxes. It’s just not true. Two thirds of the people that file bankruptcy or proposal owe some sort of income tax or HST debt. The law is designed to clean those up just like your credit cards, your bank loans, your payday loans, let’s not talk about them today. Doug Hoyes: No. We’ve covered that many times and we’ve got more to come in the next two to three weeks on some very interesting numbers on payday loans so we won’t mention them today. The bankruptcy insolvency act that you mentioned is federal legislation, the income tax act is also federal legislation. Doug Hoyes: That’s why it’s included. They’re two arms of the federal government, they both have to follow the same rules. Okay so we’ve talked about the debts that are included, why then would I file a proposal instead of a bankruptcy? Well, one of the reasons I guess is there’s a bunch of stuff I have to do in a bankruptcy that perhaps I wouldn’t have to do in a proposal. So, what are the things that I as a bankrupt person would have to do in a bankruptcy that I wouldn’t have to do if I file a consumer proposal? Ted Michalos: Well, so I want you to think about bankruptcies as the solution you use when you don’t have the ability to repay any of your debt. So, this is – it’s the thing you can do when nothing else will work. Now because of that there are very specific rules during a bankruptcy that you’ve got to comply with. So, first and foremost, bankruptcy isn’t free, there’s going to be some sort of payment based on your household income and the number of people living in the house. So, as an example a single person making $2,000 a month, bankruptcy is going to be a relatively inexpensive procedure. A single person making $5,000 a month they’re going to be penalties that are going to have to be paid because their creditors are entitled to some of that income. The government’s decided that you’re making more than a single person needs to live on. 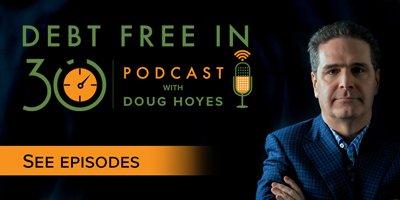 Doug Hoyes: The more you make, the more you got to pay. Ted Michalos: That’s exactly right. And to facilitate that, in a bankruptcy you’ve got to provide proof of your income. So, a normal bankruptcy or a first bankruptcy runs for nine months. For the first six or seven months you end up submitting pay stubs and reports to your trustee saying this is how much money I made. Your trustee then does a mathematical calculation to see alright are you above or below the government rules for a family of your size? If you’re below the bankruptcy runs for nine months if you’ve done everything you’re supposed to. If you’re above the guidelines, the bankruptcy runs for 21 months and there are additional payments. So, that’s part of the complication and those monthly reports are probably the most difficult thing for people to do actually after deciding to file bankruptcy because every month you’ve got to keep track of where your money goes. Doug Hoyes: And we actually think it’s a good thing. Ted Michalos: It is ’cause it teaches you to look at your money. One of the assumptions, and in many cases it’s true, people don’t actually keep track of where their money goes. So, you know how much money you’re making ’cause that’s pretty straightforward, you’re getting a paycheque every two weeks. But you don’t keep track of how you spend it and when you file bankruptcy you’re forced to keep track of well, so how much did I spent at the grocery store? How much gas did I put in the car? Did I realize I’m stopping at a coffee shop on my way to work every day and that actually adds up to $100 a month, these sorts of things. And it’s not designed to penalize you, it’s designed to let you know where’s your money going so you can decide you know what? Maybe I don’t want to do that anymore, maybe I’ll take my lunch to work, maybe I’ll fill the coffee from the coffee maker instead of stopping, so that sort of thing. Doug Hoyes: So, in a bankruptcy you’re going to keep track of both your income and your expenses and send that into your trustee because that impacts on what you are going to pay each month in a bankruptcy. In a proposal that rule doesn’t exist. What about court? Is there court in a bankruptcy? Is there court in a proposal? Ted Michalos: So, from a theoretical standpoint the court is involved in all of these procedures. From a practical standpoint it’s almost never involved in a proposal. We do literally thousands of proposals ever year and I can only think of the court being involved in one or two in the 15 years we’ve been in practice. It’s not even 15 now, it’s 17. Doug Hoyes: Yeah, it’s been a long time since 1999. Ted Michalos: You didn’t have gray hair when we started. Doug Hoyes: I know, that’s true, that’s true. Ted Michalos: Now the bankruptcy court is much more common. The reason for that bankruptcy has a set of rules that you have to follow and if you don’t follow the rules we have to put you in front of a judge to have your bankruptcy completed. Probably three out of four people bankruptcy is a straightforward procedure; the only court officer you ever see is the trustee. That fourth case though, the person doesn’t hand in their paperwork, they don’t file their taxes, they don’t pay what they’re supposed to pay or a creditor thinks that maybe something isn’t quite right and you’ll end up in court. Doug Hoyes: And I think it’s the creditor component that’s the big difference ’cause in a consumer proposal the creditors have their say upfront. Ted Michalos: That’s right and in a consumer proposal you have the ability to repay part of your debt and you’re offering a deal. It’s called a proposal because you’re saying I can afford to do this and the creditors get to say yes or no or counteroffer. And because of that they’re much less likely to resort to some sort of court action because they’ve agreed to the deal in the first place. Doug Hoyes: Yeah, so there’s nothing to complain about. Whereas in a bankruptcy, the bankruptcy happens, the creditors get notified about it, they can’t stop the bankruptcy from happening. You’re already bankrupt by the time they’re notified. So, the only recourse they have – well, there are some things they can do but one of the things they can do is say I object to this bankruptcy ending. I think the bankrupt person should have had to pay more money, they can then go to bankruptcy court to order their case. That’s a pretty unusual thing. Ted Michalos: It is. For the most part the creditors understand that if someone has filed bankruptcy, the reports that the creditor received shows why and it’s obvious. I mean the average person that we see, and it’s something like $60,000 worth of unsecured debt, you can’t service that on 30 or $40,000 a year. It’s just not humanly possible so at some point enough becomes enough and you fall back on the court for relief from that debt. Doug Hoyes: And that’s why in the vast majority of cases there is no court hearing involved in either procedure. So, what about the difference between a bankruptcy and a proposal when it comes to your psychology? Is one better than the other for the person who’s listening to us today, who’s got some debts and they’re trying to decide which one to pick? Ted Michalos: The people that we talk to, and it’s literally hundreds of people every month, tell us that they feel better about a proposal. That’s not a good reason to file one but when we do the math and we give people the options they say you know what? I do have the ability to repay a part of my debt and so I’m going to try to do that. And so there is a bias towards filing a proposal because it’s not bankruptcy, you are dealing with your debts to the best that you can. A lot of people view bankruptcy as saying I can’t deal with anything and so there’s a stigma, a social deficit to it. Doug Hoyes: It just doesn’t feel good. But it doesn’t feel good to go to the dentist and have a cavity filled either. Sometimes that’s what you’ve got to do. Ted Michalos: Well and frankly there are times when it’s the correct procedure. I mean it’s to people’s credit that they want to repay their debt but from a financial standpoint it doesn’t always make sense. I’m of the opinion that, you know, probably 60/40 so three out of every five people should be filing a proposal, the other two people out of the five bankruptcy really does make more sense. And that’s a hard conversation to have with people too. Doug Hoyes: And that’s why we sit down with them and go through both the numbers but also the psychological aspects of it. And there are people who may say yeah I understand that I might pay a little bit more in the proposal but I feel much better about it. I know that the creditors have agreed, we’re both on the same page. It’s just a business transaction at that point. Ted Michalos: Right. And there is value to that. One of the purposes of all of this, other than just getting your finances sorted out, is for you to have control of your life again, for you to feel better about your situation. Well, so if paying part of your debt back in a proposal makes you feel better, than that’s an honest valid reason to do it. Doug Hoyes: And that’s why we call it a fresh start, it’s not just for the money but it’s a fresh start in your head as well, so that’s an important thing. Excellent well I appreciate that Ted, we’re going to take a quick break and come back with a bit more information on the differences between a consumer proposal and a bankruptcy and how you can decide which one is best for you. That’s right after the break. You’re listening to Debt Free in 30. It’s time for the Let’s Get Started segment here on Debt Free on 30 where we emphasize practical advice for dealing with debt problems. We talked about consumer proposals and bankruptcies today so let’s deal with a basic question, how do I know which one I should choose? What’s the decision making process? So, Ted if someone comes to you and they’ve got some debts and it’s quite obvious that they can’t repay them on their own they’ve got to take some legal action. They’ve got to do either a proposal or a bankruptcy. How do you walk them through that decision making process? Ted Michalos: Alright, so the first thing we do is try and collect up as much information as the person’s comfortable giving us. I’ve had sessions where everything’s been pretty much anonymous because the person wasn’t comfortable at all. And I’ve had sessions where people come to me with a binder full of information, very detailed, very precise. But we need to create that picture of whatever their situation is so that we can then identify well these are the ramifications, this is what’ll happen if you deal with it as a proposal or deal with it as a bankruptcy. Doug Hoyes: And what are the things in that picture then? Ted Michalos: Yeah, so it’s what are the things that you own? Do you own a home? Do you own a car? Have you got RESPs, RRSPs, how are each one of these things affected by insolvency law? So for instance if you’ve got a house and you’ve got a equity in it, and equity means if the house was sold and all the mortgages and fees were paid, there’s money left over. In a bankruptcy you’ve got to pay an amount equal to that equity into the court or the court will sell your house. Now we don’t sell very much houses because if you’ve got equity in your house, that’s a pretty good reason to file a proposal. So, that’s one example, we look at the things that you own. And we look at the money that you have coming in. Remember in the last segment that we said the cost of filing bankruptcy is based on how much money you’re making, how many people you’re supporting. If your income is higher than the government standards so that you’re going to pay significant penalties into a bankruptcy, well that might be a good reason to file a proposal. Bankruptcies are only supposed to run nine or 21 months. A proposal can run up to 60 months so while you’ve got to pay at least the same amount of money as a bankruptcy, you’ve got five years to pay it so the payment can be significantly lower. So, a bankruptcy’s going to produce $10,000 worth of payments to your creditors, well you do that as a proposal for $200 a month over five years that’s $12,000 but it’s a lot easier than paying $500 a month in the bankruptcy. Doug Hoyes: And that’s really where the math becomes very important. So, you’re saying to yourself well okay I’m going to end up paying in your example 10 or $12,000 and obviously we’re just making up number up here, it could be a lot less than that or a different number. But do I feel more comfortable paying $500 a month for 21 months or do I feel more comfortable paying a couple of hundred dollars a month but over a longer period. Ted Michalos: Well another factor with that too is what type of income do you earn? Are you on commissions? Do you get bonuses? In the proposal, once the payment is agreed to, then it’s locked in stone. You could get a second job, you could get a raise, you could make more money and the payment doesn’t change. In the bankruptcy remember there’s that income test. If you get a bonus, you’re making more money, your payments will increase. So, sometimes a proposal makes more sense just because you know exactly what the payments going to be, it’s fixed over time. Doug Hoyes: So, when I’m trying to decide should I do a proposal or should I do a bankruptcy, one of the factors is what do I see in the future? If I know that there’s a lot of overtime in the summer and we’re coming into the summer and I’m going to make a lot of money the bankruptcy is going to cost me more. Whereas with the proposal, while the payment is fixed I know exactly what it’s going to be. I didn’t ask in the first segment but what happens if things in a proposal get really good? I’m making some good money, can I pay it off quicker? Ted Michalos: Yes, proposals are just like any kind of loan at a bank. They are completely open. Now you don’t save any money ’cause you’re not paying any interest in a proposal but you do start rebuilding your credit better and quite frankly you’ll feel better about yourself just to be done with it. So, I made a five year payment plan, the vast majority of people pay them off in about three and a half years. And that’s just because your world does tend to get better once you get back in control of your finances. Doug Hoyes: And one of the tricks we use is to say okay the creditors have agreed to a proposal where you’re paying $300 a month, but you get paid bi-weekly at work, so let’s set it up to pay $150 bi-weekly and that way in a three pay cheque month you’re going to make an extra half payment. You’ll be ahead of the game. So, in my example there, in a five year proposal if you’re paying it bi-weekly, how much sooner will you be done? Ted Michalos: Six months early. Ted Michalos: Five months early. Doug Hoyes: Five months early. You’re making an extra payment, two extra half payments in a year so you’re done five months early without even thinking about it. And if you have let’s say a tax refund or get a bonus at work you can put that on your proposal as well. Doug Hoyes: In a bankruptcy if you get a bonus at work you’re paying more. Ted Michalos: There will be a penalty. Doug Hoyes: So again, should I do a proposal or a bankruptcy, one of the factors is what do I see going forward with my income? Ted Michalos: And there’s another factor for, particularly for single parents. In a bankruptcy you’re going to lose your tax free fund for the year of the bankruptcy or possibly the year after, depending on when you file. In a proposal your tax refunds are not impacted. So, we see a lot of single parents that get, you know, two and three thousand tax refunds because of the burdens of being a single parent in our society. Well, a bankruptcy you’re going to lose that, in a proposal you don’t. And so that can be an important consideration for people too. Doug Hoyes: So, there you go, income, assets, tax refunds, those are all factors but then of course the psychology that we talked about in the first segment a well, all factor into it. That’s a good overview of the differences between a bankruptcy and a proposal and how you make the decision. That was the Let’s Get Started segment. Thanks very much Ted. I’ll be back to wrap it up in a moment. You’re listening to Debt Free in 30. Announcer: You’re listening to Debt Free in 30. Here’s your host Doug Hoyes. Doug Hoyes: Welcome back, it’s time for the 30 second of what we discussed today. On today’s show Ted Michalos and I discussed the differences between a consumer proposal and a bankruptcy, and we discussed how you can make the decision to choose one of those options over the other. That’s the 30 recap of what we discussed today. So, how do you decide whether a consumer proposal or a bankruptcy is the best option for you? First meet with a licensed insolvency trustee. There’s no point in meeting with a debt consultant or someone else who doesn’t fully understand the process. Start with a licensed insolvency trustee who can help you crunch the numbers. What will a bankruptcy cost? What will you pay in surplus income and what assets will you lose? That becomes the base case. Then determine what you can afford to pay each month. If the monthly bankruptcy payment is too much or if you have assets you don’t want to lose, a consumer proposal becomes the obvious option. As Ted mentioned there’s more to it than just the numbers. If you feel better making a deal with the people you owe money to, then a consumer proposal maybe the best option for you. How Much Debt Does it Take to File Bankruptcy in Canada? Should I File a Second Bankruptcy or a Consumer Proposal?